T’was the morn after Mardi Gras and my artist friend, who had made some of the outrageous party decorations, sat me down in front of the telly and introduced me to his all-time favourite film; The Dark Crystal. Ever since he first saw this wondrous fantasy he knew that this was the sort of world that he wanted to be a part of; a land of the imagination where, with a little help from some latex and a glue gun, amazing creatures could pit themselves against each other in battles for supremacy and sway. I soon found myself transfixed by the overblown story that unfurled before me and even more so by the extravagant costumes and sets that the characters inhabited; the evil Skeksis in their gothic castle, gorging themselves at banquets while slobbering all over their jewel-encrusted finery; the horrifying army of beetle-like Garthim, crashing through the walls of a pagan Podling party; the grotesque Aughra, keeper of a marvellous whirling machine that replicates the universe and predicts a magical alignment of three suns – all of this was a revelation to me. Here was the predecessor of films like Lord of the Rings, made well before Computer Generated Imagery and Animatronics came to the aid of filmmakers. Only in the behind-the-scenes documentary do you see that each creature is operated by up to four people, scrambling around just out of the camera’s view. I have since discovered that a secret clan of fans exists for this cult film, all of them devotees of its creator, Jim Henson, a man better known as Kermit the Frog and as the driving force behind The Muppets. 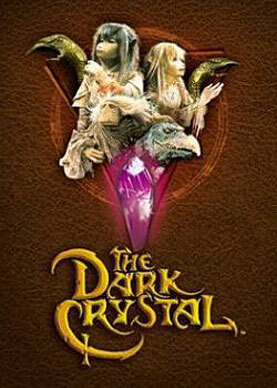 In this film Henson operates the hero puppet, Jen – a Gelfling destined to heal the eponymous Dark Crystal. Henson also co-directs with his collaborator Frank Oz, famed for his manipulation of Miss Piggy, as well as for providing the voice of Yoda in four of the Star Wars movies. After producing the original Star Wars in 1977, Gary Kurtz took on the equally challenging task of bringing this vision to the screen which, after five years in the making, stands as a benchmark of inspiring puppetry.